Any time I read an e-mail in Pantheon-mail and click (a link or something) I get all the mail scroll (up or down) to the beginning of the mail body. 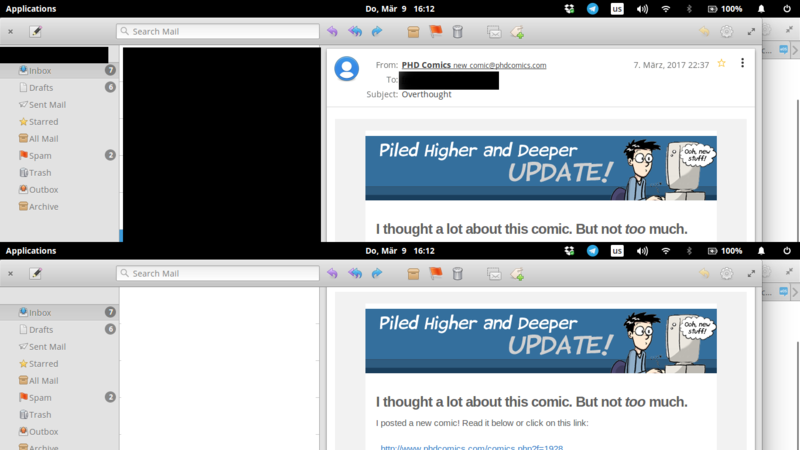 For example, if I open a new e-mail (upper half of the image) and JUST CLICK the viewer will jump from the very top to the beginning of the mail body (down half of the image). This is true for both right, middle and left click. This is true for only the first click per message. The bug is resolved in august Loki updates. Not the answer you're looking for? Browse other questions tagged release-loki pantheon-mail click or ask your own question. 'Message zoom' in pantheon-mail possible?